For other uses, see Kelp (disambiguation). Kelp grows in "underwater forests" (kelp forests) in shallow oceans, and is thought to have appeared in the Miocene, 23 to 5 million years ago. The organisms require nutrient-rich water with temperatures between 6 and 14 °C (43 and 57 °F). They are known for their high growth rate—the genera Macrocystis and Nereocystis can grow as fast as half a metre a day, ultimately reaching 30 to 80 metres (100 to 260 ft). Scuba diving in a kelp forest in California. Growth occurs at the base of the meristem, where the blades and stipe meet. Growth may be limited by grazing. Sea urchins, for example, can reduce entire areas to urchin barrens. The kelp life cycle involves a diploid sporophyte and haploid gametophyte stage. The haploid phase begins when the mature organism releases many spores, which then germinate to become male or female gametophytes. Sexual reproduction then results in the beginning of the diploid sporophyte stage, which will develop into a mature individual. The parenchymatous thalli are generally covered with a mucilage layer, rather than cuticle. 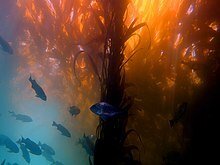 Kelp may develop dense forests with high production, biodiversity and ecological function. Along the Norwegian coast these forests cover 5800 km2, and they support large numbers of animals. Numerous sessile animals (sponges, bryozoans and ascidians) are found on kelp stipes and mobile invertebrate fauna are found in high densities on epiphytic algae on the kelp stipes and on kelp holdfasts. More than 100,000 mobile invertebrates per square meter are found on kelp stipes and holdfasts in well-developed kelp forests (Christie et al., 2003). While larger invertebrates and in particular sea urchins Strongylocentrotus droebachiensis (O.F. Müller) are important secondary consumers controlling large barren ground areas on the Norwegian coast, they are scarce inside dense kelp forests. Giant kelp can be harvested fairly easily because of its surface canopy and growth habit of staying in deeper water. Kelp ash is rich in iodine and alkali. In great amount, kelp ash can be used in soap and glass production. Until the Leblanc process was commercialized in the early 19th century, burning of kelp in Scotland was one of the principal industrial sources of soda ash (predominantly sodium carbonate). Alginate, a kelp-derived carbohydrate, is used to thicken products such as ice cream, jelly, salad dressing, and toothpaste, as well as an ingredient in exotic dog food and in manufactured goods. Alginate powder is also used frequently in general dentistry and orthodontics for making impressions of the upper and lower arches. Kombu (昆布 in Japanese, and 海带 in Chinese, Saccharina japonica and others), several Pacific species of kelp, is a very important ingredient in Chinese, Japanese, and Korean cuisines. Kombu is used to flavor broths and stews (especially dashi), as a savory garnish (tororo konbu) for rice and other dishes, as a vegetable, and a primary ingredient in popular snacks (such as tsukudani). Transparent sheets of kelp (oboro konbu) are used as an edible decorative wrapping for rice and other foods. Kombu can be used to soften beans during cooking, and to help convert indigestible sugars and thus reduce flatulence. 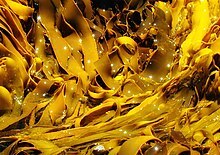 In 2010, researchers found that alginate, the soluble fibre substance in sea kelp, was better at preventing fat absorption than most over-the-counter slimming treatments in laboratory trials. As a food additive, it may be used to reduce fat absorption and thus obesity. Kelp in its natural form has not yet been demonstrated to have such effects. Commercial production of kelp harvested from its natural habitat has taken place in Japan for over a century. Many countries today produce and consume laminaria products; the largest producer is China. Laminaria japonica, the important commercial seaweed, was first introduced into China in the late 1920s from Hokkaido, Japan. Yet mariculture of this alga on a very large commercial scale was realized in China only in the 1950s. Between the 1950s and the 1980s, kelp production in China increased from about 60 to over 250,000 dry weight metric tons annually. Kelp has a high rate of growth and its decay is quite efficient in yielding methane, as well as sugars that can be converted to ethanol. It has been proposed that large open-ocean kelp farms could serve as a source of renewable energy. Unlike some biofuels such as corn ethanol, kelp energy avoids "food vs fuel" issues and does not require freshwater irrigation. Some of the earliest evidence for human use of marine resources, coming from Middle Stone Age sites in South Africa, includes the harvesting of foods such as abalones, limpets, and mussels associated with kelp forest habitats. In 2007, Erlandson et al. suggested that kelp forests around the Pacific Rim may have facilitated the dispersal of anatomically modern humans following a coastal route from Northeast Asia to the Americas. This "kelp highway hypothesis" suggested that highly productive kelp forests supported rich and diverse marine food webs in nearshore waters, including many types of fish, shellfish, birds, marine mammals, and seaweeds that were similar from Japan to California, Erlandson and his colleagues also argued that coastal kelp forests reduced wave energy and provided a linear dispersal corridor entirely at sea level, with few obstacles to maritime peoples. Archaeological evidence from California's Channel Islands confirms that islanders were harvesting kelp forest shellfish and fish, beginning as much as 12,000 years ago. During the Highland Clearances, many Scottish Highlanders were moved on to areas of estates known as crofts, and went to industries such as fishing and kelping (producing soda ash from the ashes of kelp). At least until the 1840s, when there were steep falls in the price of kelp, landlords wanted to create pools of cheap or virtually free labour, supplied by families subsisting in new crofting townships. Kelp collection and processing was a very profitable way of using this labour, and landlords petitioned successfully for legislation designed to stop emigration. But the economic collapse of the kelp industry in northern Scotland led to further emigration, especially to North America. Natives of the Falkland Islands are sometimes nicknamed "Kelpers". This designation is primarily applied by outsiders rather than the natives themselves. In Chinese slang, "kelp" (simplified Chinese: 海带; traditional Chinese: 海帶; pinyin: hǎi dài), is used to describe an unemployed returnee. [clarification needed] It has negative overtones, implying the person is drifting aimlessly, and is also a homophonic expression (Chinese: 海待; pinyin: hǎidài, literally "sea waiting"). This expression is contrasted with the employed returnee, having a dynamic ability to travel across the ocean: the "sea turtle" (simplified Chinese: 海龟; traditional Chinese: 海龜; pinyin: hǎi gūi) and is also homophonic with another word (simplified Chinese: 海归; traditional Chinese: 海歸; pinyin: hǎi gūi, literally "sea return"). Overfishing nearshore ecosystems leads to the degradation of kelp forests. Herbivores are released from their usual population regulation, leading to over-grazing of kelp and other algae. This can quickly result in barren landscapes where only a small number of species can thrive. Other major factors which threaten kelp include marine pollution and the quality of water, climate changes and certain invasive species. 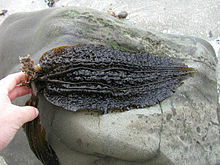 Bull kelp, Nereocystis luetkeana, a northwestern American species. Used by coastal indigenous peoples to create fishing nets. Kombu, Saccharina japonica (formerly Laminaria japonica) and others, several edible species of kelp found in Japan. Northern kelp crab (Pugettia producta) and graceful kelp crab (Pugettia gracilis), Pacific coast of North America. Kelpfish (blenny) (e.g., Heterosticbus rostratus, genus Gibbonsia), Pacific coast of North America. ^ William Miller, III (13 October 2011). Trace Fossils: Concepts, Problems, Prospects: Chapter 13 "Zoophycos and the Role of Type Specimens in Ichnotaxonomy by Davide Olivero. Elsevier. pp. 224–226. ISBN 978-0-08-047535-6. Retrieved 1 April 2013. ^ Migula, W. (1909). Kryptogamen-Flora von Deutschland, Deutsch-Österreich und der Schweiz. Band II. Algen. 2. Teil. Rhodophyceae, Phaeophyceae, Characeae. Gera: Verlag Friedriech von Zezschwitz. pp. i–iv, 1–382, 122 (41 col.) pls. ^ Bolton, John J. (23 July 2010). "The biogeography of kelps (Laminariales, Phaeophyceae): a global analysis with new insights from recent advances in molecular phylogenetics". Helgoland Marine Research. 64 (4): 263–279. doi:10.1007/s10152-010-0211-6. ^ Fritsch, F. E. (1945). Structure and Reproduction of the Algae, Volume 2. Cambridge University Press. p. 226. ISBN 9780521050425. OCLC 223742770. ^ Abdullah, M.I., Fredriksen, S., 2004. Production, respiration and exudation of dissolved organic matter by the kelp Laminaria hyperborea along the west coast of Norway. Journal of the Marine Biological Association of the UK 84: 887. ^ Rinde, E., 2009. Dokumentasjon av modellerte marine Naturtyper i DNs Naturbase. Førstegenerasjonsmodeller til kommunenes startpakker for kartlegging av marine naturtyper 2007. NIVA report, 32 pp. ^ Christie, H., Jørgensen, N.M., Norderhaug, K.M., Waage-Nielsen, E., 2003. Species distribution and habitat exploitation of fauna associated with kelp (Laminaria hyperborea) along the Norwegian coast. Journal of the Marine Biological Association of the UK 83, 687-699. ^ Jørgensen, N.M., Christie, H., 2003. Follow me @radd.michyy and lowk3y.nadine l Diurnal, horizontal and vertical dispersal of kelp associated fauna. Hydrobiologia 50, 69-76. ^ Norderhaug, K.M., Christie, H., Rinde, E., 2002. Colonisation of kelp imitations by epiphyte and holdfast fauna; a study of mobility patterns. Marine Biology 141, 965-973. ^ Norderhaug, K.M., Christie, H., 2009. Sea urchin grazing and kelp re-vegetation in the NE Atlantic. Marine Biology Research 5, 515-528. ^ Clow, Archibald; Clow, Nan L. (1952). Chemical Revolution. Ayer Co Pub. pp. 65–90. ISBN 978-0-8369-1909-7. OCLC 243798097. ^ Uzunović, Alija; Mehmedagić, Aida; Lačević, Amela; Vranić, Edina (2004-11-20). "Formulation ingredients for toothpastes and mouthwashes". Bosnian Journal of Basic Medical Sciences. 4 (4): 51–58. doi:10.17305/bjbms.2004.3362. ISSN 1840-4812. PMID 15628997. ^ Rychen, Guido; Aquilina, Gabriele; Azimonti, Giovanna; Bampidis, Vasileios; Bastos, Maria de Lourdes; Bories, Georges; Chesson, Andrew; Cocconcelli, Pier Sandro; Flachowsky, Gerhard (2017). "Safety and efficacy of sodium and potassium alginate for pets, other non food-producing animals and fish". EFSA Journal. 15 (7): e04945. doi:10.2903/j.efsa.2017.4945. ISSN 1831-4732. ^ Iodine Helps Kelp Fight Free Radicals and May Aid Humans, Too Newswise, Retrieved on July 8, 2008. ^ "Is Seaweed The Answer To A Dieter's Prayer?". Sky News. March 22, 2010. Archived from the original on March 25, 2010. Retrieved March 23, 2010. ^ Christiansen, Ryan C. (2008-10-31). "British report: Use kelp to produce energy". Biomassmagazine.com. Retrieved 2013-02-12. ^  dictionary.com definition for "Kelper"
^ Dayton, P.K. 1985a. Ecology of kelp communities. Annual Review of Ecology and Systematics 16: 215-245. ^ Sala, E., C.F. Bourdouresque and M. Harmelin-Vivien. 1998. Fishing, trophic cascades, and the structure of algal assemblages: evaluation of an old but untested paradigm. Oikos 82: 425-439. ^ Planet, Team (2012-01-12). "Green Glossary: Kelp Forests: Other Marine Life: Animal Planet". Animals.howstuffworks.com. Archived from the original on 2012-10-24. Retrieved 2013-02-12. Erlandson, J.M., M.H. Graham, B.J. Bourque, D. Corbett, J.A. Estes, & R.S. Steneck. 2007. The Kelp Highway hypothesis: marine ecology, the coastal migration theory, and the peopling of the Americas. Journal of Island and Coastal Archaeology 2:161-174.